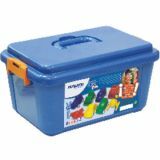 Made of flexible yet sturdy plastic, these colorful 3 1⁄2"L vehicles feature non-removable safety wheels. Ages 1 1⁄2-5. 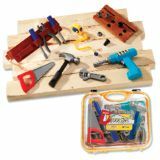 Everything young builders need for a day on the job! 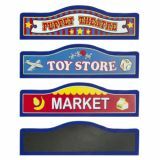 Features interchangeable marquis signs, allowing children to use it as a Puppet Theater, Toy Store, Market, or using the chalkboard marquis - whatever their imaginations dream up! Below the ledge a clock with moveable hands and a chalkboard front help announce the start of the show! Cotton canvas side curtains and front curtains with Velcro tie-backs enhance the theatrical experience. Wooden frame ensure years of safe use. Adult assembly required. Pretend and Play Floor Theater. 24"W x 15"D x 51 1⁄2"H. Weight 15 lbs. 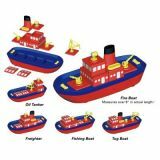 Build-A-Boat comes with 10 colorful pieces that allow you to build a fireboat, tug boat, freighter, oil tanker, fishing boat or the boat of your dreams. The secret lies in our hidden magnetic locking system that makes both assembly and disassembly a snap. Once you've built your boat, you're ready to launch her in your bathtub, sink, or swimming pool. Our waterproof hull guarantees a safe voyage and hidden wheels make her easy to push for those who are landlocked. We call it "Creativity on the high seas!" What's for lunch? 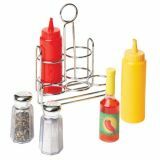 Delicious, healthy lunch items feature a contemporary design and are made of durable, rubberized plastic! 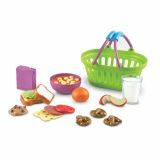 Glass of milk, juice box, soup in bowl, 3 mini pretzels, clementine, lettuce slice, tomato slice, 2 slices of bread, cheese slice, salami slice, swiss cheese slice, cookie and 2 apple slices. 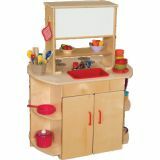 This compact Kitchen Center features 5 major appliances in one attractive play island. Complete with stove, oven, microwave, sink, and dishwasher space with fixed shelf. Features turning knobs, silk-screened controls, acrylic windows on appliance doors, write-on wipe-off board, and wooden shelves for loads of storage. Constructed of 100% Plywood with our exclusive Tuff-Gloss™ UV finish. GREENGUARD® Gold certified. 44"H x 32"W x 24"D. Weight 90 lbs. Additional shipping charges apply. 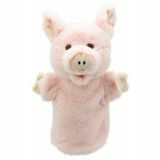 Easy-to-program telephone helps children learn how to call home, the 911 Emergency Service, and other important telephone numbers. Program in any number and record a message. When children dial the number correctly, they are rewarded by hearing your personal message. Program and record new messages again and again! 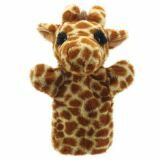 Features realistic ring and big buttons for little hands. Self Help - Operating a phone is a practical skill that students will use their entire lives. 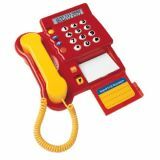 This pretend phone helps teach real skills in a controlled, relaxed manner. Social/Behavioral - Telephone practice and preparedness help boost students' confidence in independence, safety, and Iife skills. 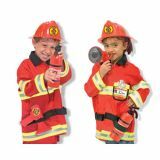 Language - Helps students practice what to say and do in an emergency. Students learn how to answer questions like, "Where do you live?," "What is the emergency?," and "What is your name?" 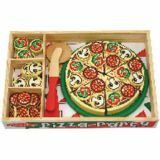 Wooden set features a delicious pizza, over 50 toppings, spinning slicer and spatula. 63 pieces.